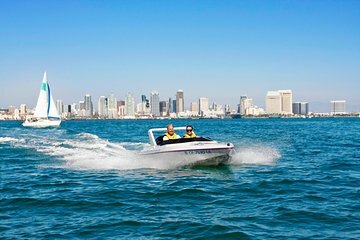 After making your own way to the Cabrillo Isle Marina in San Diego Harbor, your guide welcomes you to your speed boat adventure. Start off with a safety briefing taught by your professional guide, followed by a lesson on hand signals and boating rules. You’ll navigate and your own F13 speed boat for the entirety of the tour, following the lead of your guide who sets the pace in a different boat. Your boat is equipped with a two-way communication systems that allows you to hear your guide throughout the tour. If you want to change drivers you may do so at any of the brief stops. Set out on your 13-mile (20-km) spin around San Diego Harbor, which includes several stops for photo ops and a closer look at points of interest throughout the harbor. 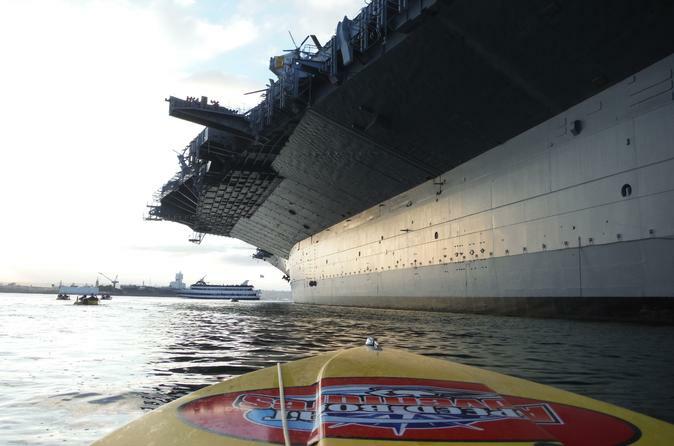 Enjoy close views from your vantage point on the water of US Navy ships and aircraft carriers such as the USS Midway, home to a museum that offers insights into the history of this famous vessel. Zip over to see the famous vessel the Star of India, one of several historic ships berthed at the San Diego Maritime Museum. You'll also pass the Coronado Bridge, Seaport Village, the cruise ship terminal, and have excellent views of the downtown skyline and possibly the sea lions that live in these waters. Choose from four departure times in the morning and afternoon for your 2-hour tour of San Diego Harbor.